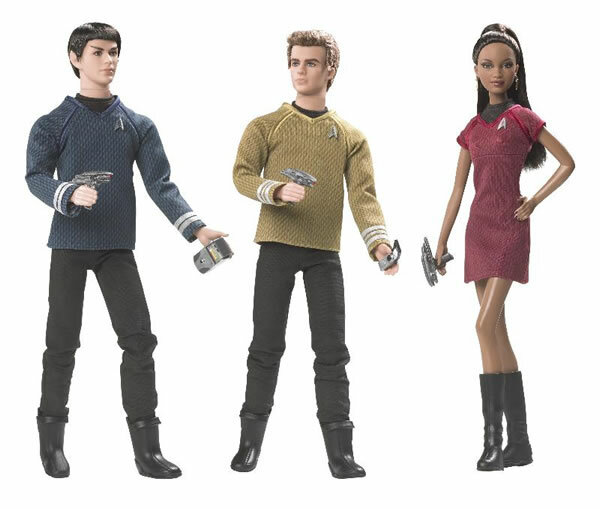 Iran cracked down on Barbie dolls. If you remember my post from several months ago, I told you about how Barbie has become a terrorist. Now, she has been seized and is a hostage in several cities in Iran. Free Barbie. 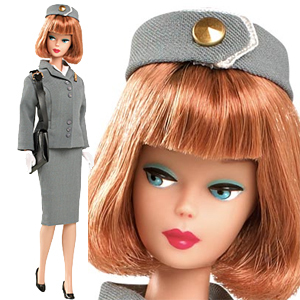 We do not have any information as to what she was wearing at the time of the abduction, but she may have been in the retro Pan-Am stewardess uniform. Update: Captain Kirk, Spock and Uhura Barbie have entered the search. Barbie dolls: strictly forbidden -- they contradict Islamic values. Head of the Ministry of Culture and Islamic Gudance in Iran's Lorestan Province Ali Esmailian said that import of Barbie dolls in Iran is forbidden because they contradict Islamic values and Iranian culture, ISNA reported today. Esmailian said that all Barbie dolls are being seized. He did not explain what Barbie dolls do with Islamic values or Iranian culture exactly, but argued that launching a campaign against Barbie dolls is aimed to prevent foreign influence tricks in Iran. Iranian conservative government fights against any sign of what they call "western values and cultural invasion". Iranian Police closed dozens of shops which were selling Barbie dolls in January 2012. Barbie is a fashion doll manufactured by the American toy-company Mattel, Inc. and launched in March 1959. There are also some computer Barbie games for children. Esmailian said that these games should be prevented and the sellers of these kinds of games would be punished. Read this on hope and the Dems. Funny and sad. Off to Holy Mass-NO Latin. More on that later. 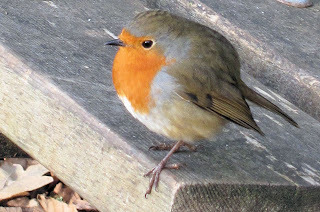 But, a robin moved into the neighbourhood and sang copious trills this morning. is telling us that Autumn and Winter is on the way. It use to be called the "Winter Bird", but in recent years, the robin has been staying all year round. Well, I decided to add another Ignatian Meditation. This is the last one of last week's gospel. Part of the reason I am sharing is to encourage you to stay with one passage for a week and go back to it over and over. Meditation brings out the richness of the text. 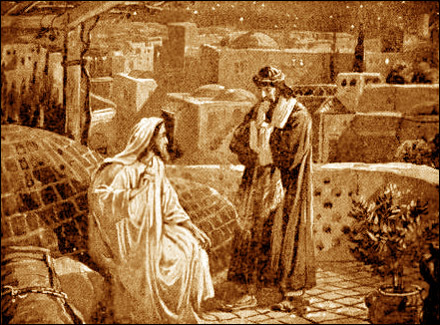 One more point, Christ purposefully referred to the Prophet Isaiah when talking to the scribes and Pharisees. Here is the reference: Isaiah 29:13 The Lord says: "These people come near to me with their mouth and honour me with their lips, but their hearts are far from me. Their worship of me is made up only of rules taught by men. Christ chooses this passage not only because it refers to hypocrisy, but because it is Isaiah who states it. of Isaiah immediately as not only a rebuke, but "the" reference to Messianic claims. Only two that we know of went home and thought on these things: SS. 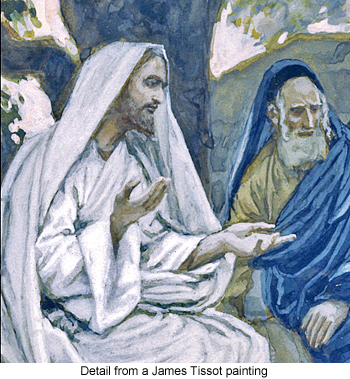 Joseph of Arimathea and Nicodemus. The Catholic Encyclopaedia states this on Joseph: I leave the links in for your perusal. All that is known for certain concerning him is derived from the canonical Gospels. He was born at Arimathea — hence his surname — "a city of Judea" (Luke 23:51), which is very likely identical with Ramatha, the birthplace of the Prophet Samuel, although several scholars prefer to identify it with the town of Ramleh. He was a wealthy Israelite (Matthew 27:57), "a good and a just man" (Luke 23:50), "who was also himself looking for the kingdom of God" (Mark 15:43). 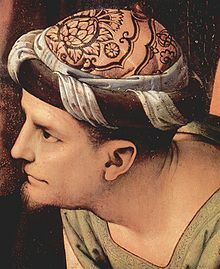 He is also called by St. Mark and by St. Luke a bouleutes, literally, "a senator", whereby is meant a member of the Sanhedrin or supreme council of the Jews. He was a disciple of Jesus, probably ever since Christ's first preaching in Judea (John 2:23), but he did not declare himself as such "for fear of the Jews" (John 19:38). On account of this secret allegiance to Jesus, he did not consent to His condemnation by the Sanhedrin (Luke 23:51), and was most likely absent from the meeting which sentenced Jesus to death (cf. Mark 14:64). The Crucifixion of the Master quickened Joseph's faith and love, and suggested to him that he should provide for Christ's burialbefore the Sabbath began. Unmindful therefore of all personal danger, a danger which was indeed considerable under the circumstances, he boldly requested from Pilate the Body of Jesus, and was successful in his request (Mark 15:43-45). Once in possession of this sacred treasure, he — together with Nicodemus, whom his courage had likewise emboldened, and who brought abundant spices — wrapped up Christ's Body in fine linen and grave bands, laid it in his own tomb, new and yet unused, and hewn out of a rock in a neighbouring garden, and withdrew after rolling a great stone to the opening of the sepulchre (Matthew 27:59, 60; Mark 15:46; Luke 23:53; John 19:38-42). Thus was fulfilled Isaiah's prediction that the grave of the Messias would be with a rich man (Isaiah 53:9). The Greek Church celebrates the feast of Joseph of Arimathea on 31 July, and the Roman Churchon 17 March. The additional details which are found concerning him in the apocryphal "Acta Pilati", are unworthy of credence. Likewise fabulous is the legend which tells of his coming to Gaul A.D. 63, and thence to Great Britain, where he is supposed to have founded the earliest Christian oratory at Glastonbury. Finally, the story of the translation of the body of Joseph of Arimathea from Jerusalem to Moyenmonstre (Diocese of Toul) originated late and is unreliable. I knew this before, this truth, but it came back to my consciousness when thinking of last week's gospel. This might seem shocking, but the Pharisees and scribes had a right to question Jesus on the behaviour of his apostles. Why? The entire Jewish religion was based on two things: The Law and The Prophets. These two pillars of Truth formed the entire Jewish religion, the relationships with the community and the temple worship. The Covenant of Abraham was the foundation for the Law and the Law demanded the continuation and renewal of the Covenant. Christ came along and challenged the Law and the Prophets. He demonstrated by His behaviour and He claimed by His words that He was greater than the Law and the Prophets. That is the real reason for the questions of the Pharisees. That is why they questioned Him. He was doing away with what had laid the foundation for His Coming and they could see that. And, this is why Christ calls them hypocrites. Because they knew that the Messiah would come and be a manifestation of the Law and the Prophets, when they saw this possibility in Christ, they responded with a loud NO. Christ is the embodiment of the New Law. He is the Prophet promised to come, and that is why the Pharisees rejected Him. Their hearts were not prepared for the challenge and the change. They really did not want the Messiah to come, yet....They did not want to give up their power for His Power. Christ tried and they refused to listen. The Gentiles accepted the New Law, the King, Priest and Prophet Who is Christ. I am finishing up two Ignatian meditations on last week's gospel. Again, the passage was the one in which Christ engaged the Pharisees and scribes in a discussion on the real meaning of the Law. 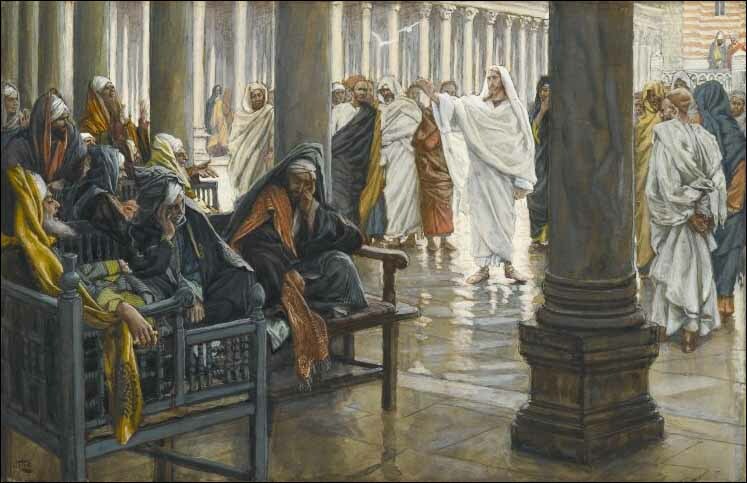 Sometimes people forget that Christ talked with the Pharisees and did not ignore them. Because they were highly educated and the intellectual elite of the day, Christ could challenge them regarding the spirit of the Scriptures as well as the letter of the Law. Christ is not telling anyone to ignore the Law. In fact, I think He allowed the apostles not to wash, or did not correct them on purpose to make a point with the Pharisees. This is good teaching. When I taught, in a few cases, I would let someone make bad points in a debate just to show what one should not do. Everyone had a chance to learn by seeing and doing. Christ is the Teacher, the Best Teacher. He knows His audience and what that group can handle. The huge point of the list of sins turns around the word "intentions". Christ is changing the rules of the game of salvation. Avoiding sin is not enough. One's heart, mind and soul must be purified. Intentions, not actions, are first addressed by Christ. What is our intention? Do we get angry and judge interiorally quickly? Do we despair and fall into sorrow too soon after a disappointment? People cannot see all their own the sins without grace. Some are only intentions of vice, but vice none the less. Christ raises the bar of perfection and the Pharisees know exactly what He is doing. They are objecting to the new challenge of holiness. They fight this. They want sins to remain external only. Oh no, we cannot be judged on our evil thoughts and evil desires. Oh, no. Oh, yes. And that is one of Christ's points here. To be clean outside one must be clean inside. Washing hands is merely a symbol of interior purity.